The Nagayama district in Asahikawa City is named after Nagayama Takeshiro. Are there still historical material and stories related to Takeshiro in the district? Nagayama district is filled with large retail stores on Route 39. Development of the wilderness in Kamikawa began here. 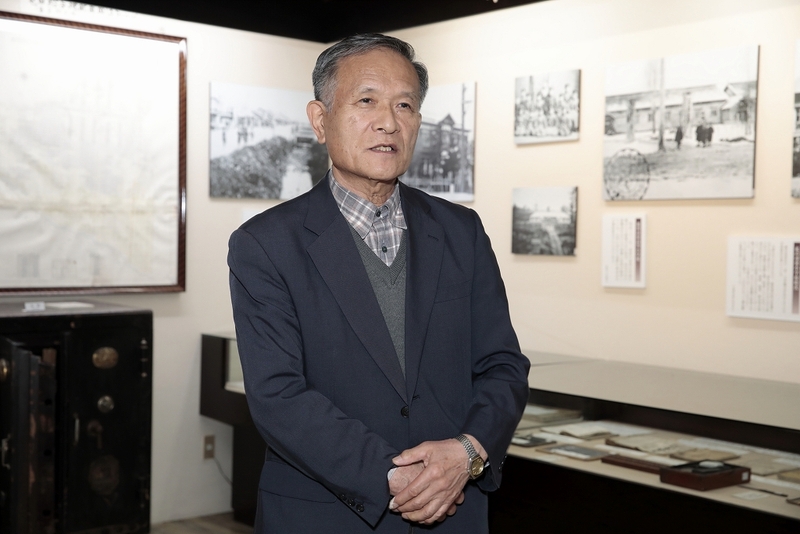 “During my childhood, I was surrounded by rice fields,” says local historian Saito Kazu, 85 years old. Kazu was born and raised in Nagayama Village, and married Saito Masaru, a third-generation Tondenhei (farmer soldier.) She lived her whole life in Nagayama. 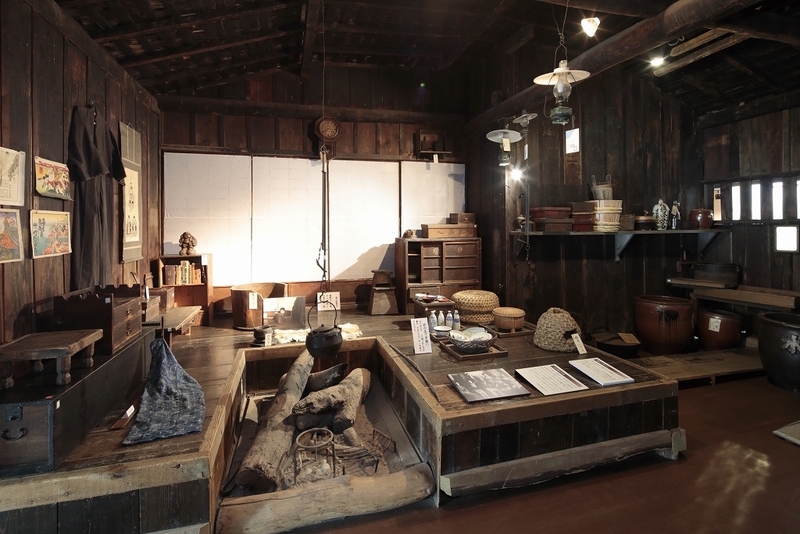 Kazu has participated in the compilation of many local historical documents while working for the Secretariat of the Nagayama Collection Local Museum. The people must have been proud of living in the district named after the General. In 1921, the new main building of the shrine was completed, and a military sword, cap and saber treasured by the General were presented by Takeshiro’s son, Nagayama Taketoshi. We visited Asahikawa Heison Memorial Museum, where one can experience life in the days of the Tondenhei. 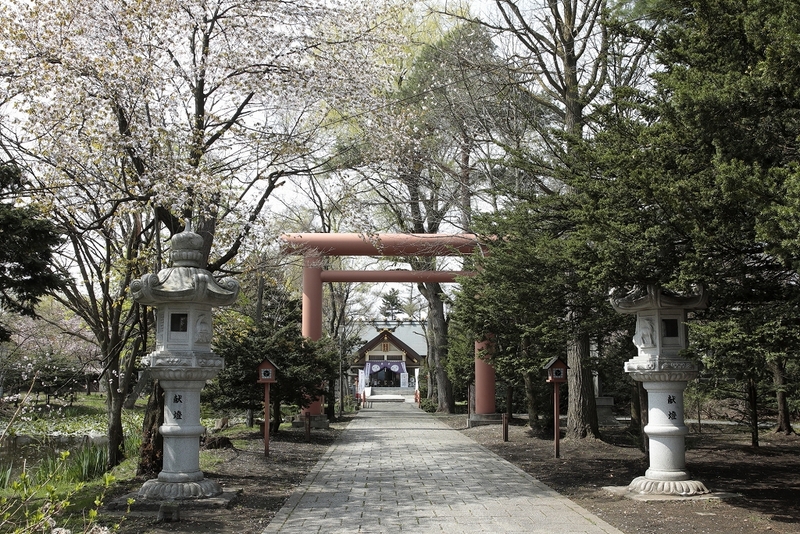 It is located in the Higashi Asahikawa district, south of Nagayama. Acting director Nakatani Yoshihiro was our guide. He lived in a Tondenhei house in Asahikawa for several years when he was a child. 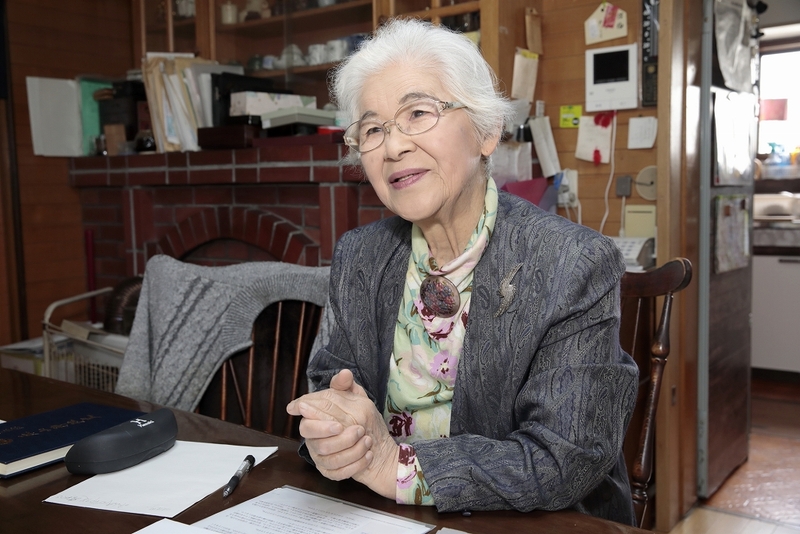 “There were many descendants of the Tondenhei when I was a child,” recalls Nakatani Yoshihiro. A panel near the exit of the exhibition room shows the population of persons who moved to three Tondenhei villages, Nagayama, Asahikawa and Tohma, by prefecture. A detached palace is where the Emperor resides during the summer and is a place of rest. The tendency to think, “Let’s move to the place where the detached palace will be constructed,” gained momentum, but such plans were never realized. 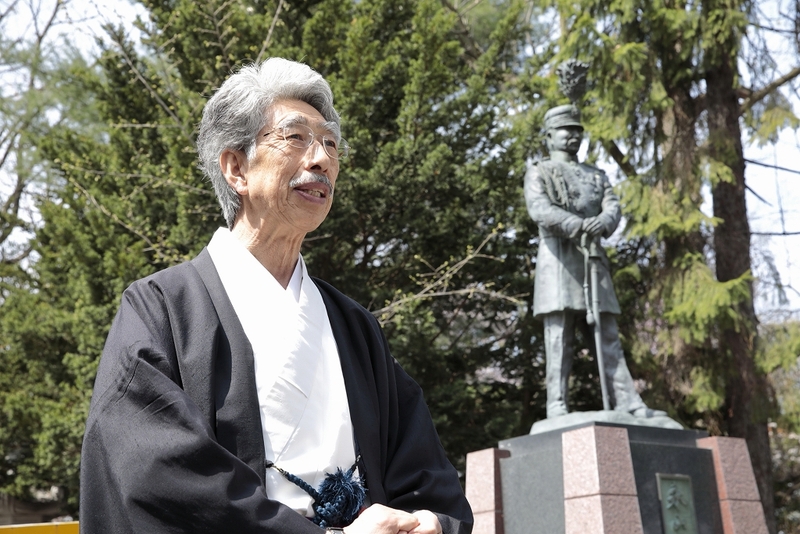 The first Commander of the 7th Division of the former Imperial Japanese Army, Nagayama Takeshiro also served as the 2nd Director General of the Hokkaido Government. The year of his death in 1904, was the same year as the Russo-Japanese War, and Nagayama was most likely anxious about the future of the war. 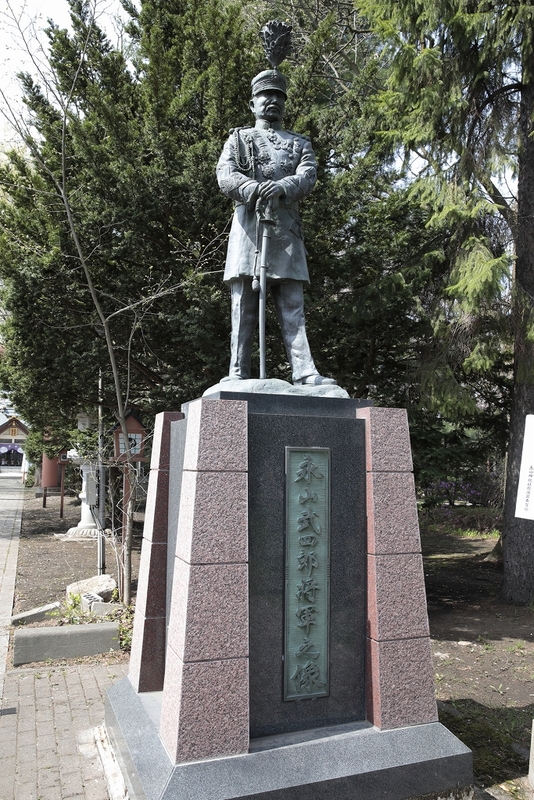 The statue of Nagayama Takeshiro in uniform erected near Nagayama Shrine still stares toward the northeast with a saber in his hand.